In this, my last post until September, I take a quick look at the IEA’s latest renewables projections. The IEA has just produced its World Energy Outlook Special Report on Energy and Climate Change, which is intended to describe how the energy sector can transition to being part of a lower carbon world. It includes a new Bridge Scenario which emphasises what can be done over the next decade or two. There is much that is good in the report, including its mention of the potential to reduce methane emissions from the energy sector, a subject which I’ll return to in a future post. However its renewables projections are less satisfactory. I previously noted how the IEA has vastly underestimated renewables growth in the past (see here), and that their current projections show future rates of deployment of renewables slowing substantially from present levels (see here). I had hoped that, especially given its topic, this latest report would include a more realistic outlook for renewables. However even the Bridge Scenario projections continue to look much too pessimistic. The table below shows a comparison of the IEA’s wind and solar PV projections for the 2020s with actual installations for last year and expected rates for this year. It shows that the IEA projects installation rates for the 2020s at about last year’s level and below levels expected for this year, implying a stagnation or contraction of the industry rather than continued growth, even as measures to reduce emissions are increased. Notes: Historic data is taken from Bloomberg, BP, and the Global Wind Energy Council (GWEC). Data for wind installation in 2014 is similar at 49 GW, 52GW, and 51 GW respectively according to each source. Different data sources give somewhat different values for the amount of solar PV installation in 2015. BP shows solar PV at around 40GW, Bloomberg around 45GW. I have taken the mid-point of these two values. There are various possible explanations for the difference, for example different estimates of which projects were completed by the end of the year. Previous years’ estimates for the amount of solar PV installed are very similar between the two sources (within a GW or so). The chart below (an update from my previous post) shows this data graphically, and compares it with history and the IEA’s 2014 World Energy Outlook New Policies Scenario. It shows welcome but limited increases in the rate of installation of both wind and solar PV projected by the IEA. There is still a clear trend break between history and the projections. 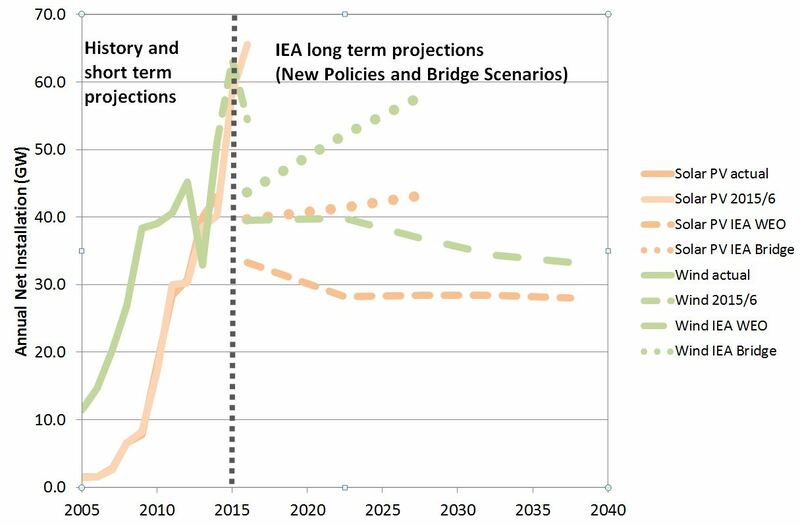 Note: IEA projections are for 2012 or 2013-2020 and for each 5 years thereafter, and are shown at the mid-point of each interval. 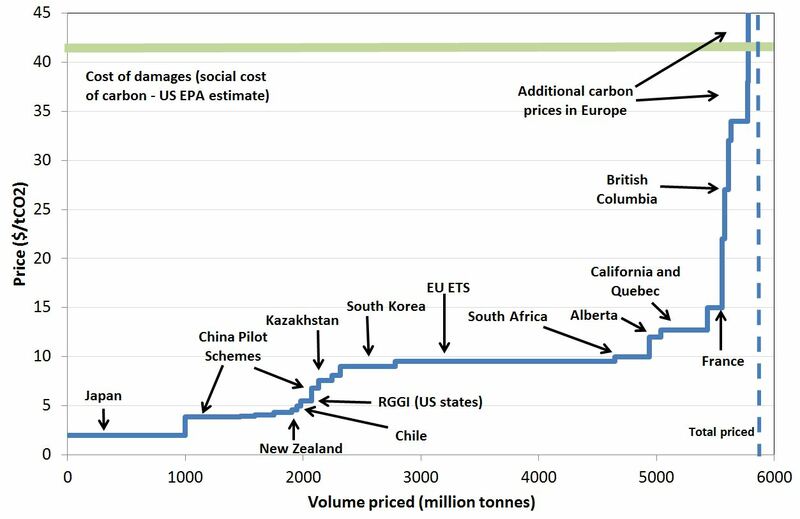 The IEA seems to continue to be concerned about the costs of renewables, leading them to be very cautious in their projections. But with costs falling, pressure for action to reduce emissions increasing, and penetration of both wind and solar PV globally remaining well below saturation levels, continued growth in the rate of deployment seems much more likely than stagnation or decline. The IEA’s work is widely respected and quoted. This makes it all the more important that their renewables scenarios become more realistic. Currently they serve mainly to distort the public debate on pathways to decarbonisation, and detract from the other good work in this area that the IEA does. The time for the IEA to improve its projections for renewables seems long overdue. This entry was posted in Climate change policy on 27/06/2015 by adamwhitmore. Environmental protection forms part of the mainstream of the Anglo-American conservative political tradition. Policy debate on climate change should recognise this. Climate change is often seen as a politically divisive issue, with those on the left more active and concerned than conservatives. And indeed there is much evidence that those with different values perceive the issue differently[i]. However, concern about climate change can be placed firmly in the mainstream of the conservative tradition[ii]. Such sentiments have in the past been translated into action by conservative politicians. The 1956 Clean Air Act was passed by a Conservative government in the UK, and the US Environmental Protection Agency was founded in 1970 during the Nixon presidency. The UK Climate Change Act was passed in 2008 with cross party support, with only five Members of Parliament (less than 1%) voting against. Going further back, the UNFCCC was signed by British Conservative Prime Minister John Major and by Republican US President George Bush, along with the representatives of over 160 other governments. The Hadley Centre, one of the world’s leading climate research centres, was established in 1990 under a Conservative government led by Margaret Thatcher, who opened the centre herself. There is, and should be, much debate about the specific details of climate change policy. But there should be no debate about the necessity and value of the objective of safeguarding the earth. When Margaret Thatcher and the Dalai Lama can express almost the same idea in almost the same terms, people can surely develop a sense of common purpose about preventing severe climate change. This has never been more necessary. [i] See here for a discussion of this. [ii] I talk in this post about traditional conservatism. A discussion of the more difficult case of libertarianism and climate change will need to await another post, but even there I think common ground can be found. I also recognise that the actions of the Republican Party in the USA at the moment often diverge from traditional conservatism. There is also a strand of thinking on the left which has in the past neglected environmental issues, but this is less prominent than it was. Pope Francis, among others, appears much more inclined to adopt the perspective of a Christian duty to safeguard God’s creation. [vi] Speech to Conservative Party Conference, 1988 Oct 14 Fr. For other examples of her views on climate change and environmental issue see: Speech to the Royal Society (1988 Sep 27), Speech to Conservative Party Conference (1989 Oct 13), Speech to United Nations General Assembly, Global Environment (1989 Nov 8) and Speech at 2nd World Climate Conference (1990 Nov 6). See http://www.margaretthatcher.org/ for the full text of each speech. In her later writings she expressed scepticism about the motives of some advocating action on climate change, but that should not detract from her well-informed concern and advocacy of action while in office. [vii] The universe in Single Atom, Dalai Lama (2005), Chapter Nine. This statement was in the context of the need to respect the Earth’s biological heritage. This entry was posted in Climate change policy on 11/06/2015 by adamwhitmore.